Years back the South African International Relations Department reported on the recovery of photographer Anton Hammerl’s body who was shot dead by Libyan forces during April and confirmed in May. On 5 April 2011, South African photographer Anton Hammerl was killed, allegedly by Libyan forces on the Brega frontline. According to eyewitnesses, Hammerl’s injuries were such that he could not have survived without medical attention. Consequently, he died in the desert. 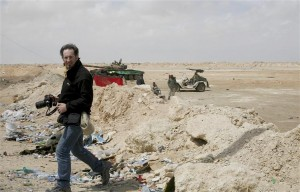 Hammerl and other frontline journalists were taken by Libyan forces to Brega, Libya, during the rebels’ attempt to oust Muammar Gaddaffi’s regime in February 2011. South African International Relations and Co-operation Minister Maite Nkoana-Mashabane said that South Africa was doing its best to find him and bring his body back home so that his family could give him a decent funeral. That was reported in the media April 2012. DNA tests are being sent to confirm whether the remains of SA photographer Anton Hammerl, killed in April last year, have been found. Coffin number 57, taken from a mass grave in Libya, may hold the remains of South African photographer Anton Hammerl. The body was one of 170 in a mass grave, 80 of which have now been identified, and the remainder placed in coffins. The digging, supervised by the Ministry of Martyrs, Wounded and the Missing under the behest of families hoping to identify their dead, took four days. The body in coffin 57, said to be the same height as Anton and has similar dark hair, allegedly died around 5 April. There was also what appeared to be a camera lens nearby. However a witness to the exhumation said the last person to see Hammerl alive could not definitely identify him due to the advanced decomposition. â€œI couldn’t look for too long, the smell was really bad,” he said. According to the witness a DNA sample has been taken from pieces of bones and teeth and, as Libya lacks the capacity to do DNA tests, sent to the headquarters of the International Commission on Missing Persons (ICMP) in Bosnia. The coffin has been reburied with others at the cemetery in Benghazi, mapped so that they could be exhumed once their identity has been established. Hammerl, previously the chief photographer of the Johannesburg Saturday Star, had moved to London in 2006 with his wife Penny Sukhraj-Hammerl. In March 2011 he left to cover the conflict in Libya. Early in April 2011, he was reported as captured along with four other journalists, Clare Morgana Gillis, James Foley, Manu Brabo and Nigel Chandler. They were released in mid-May, but there was no news of Anton. His family were informed that he had been shot dead by militia loyal to Muammar Gadaffi near the town of Brega on 5 April 2011. Gillis, Foley and Brabo had returned to Libya in hope of finding his body after reports of a white man being buried in the mass grave. From Anton — and from two other photographers I came to know in Libya, Samuel Aranda and João Pina — I learned that photojournalism is not just about taking riveting photos and selling them to whomever will pay. It’s about becoming familiar with the world — paying attention not just to the who-what-when-where of a breaking story framed in the apposite image, but to the why. Photojournalists — at least the best ones, like Anton and Samuel and João — know that to seal the texture and history of a moment in an image, or to capture the struggles of the everyday in a subject’s face, you need to understand the stories and the forces of society behind them. Perhaps all journalists already know this. I’m sure all photojournalists do. But I didn’t. We sociologists may think we have a monopoly on the practice of sociology. We don’t. South African photojournalist Anton Hammerl is believed to have died on April 5 when he and three other journalists were attacked by loyalist forces on the outskirts of Brega. But news of Anton’s likely death only came to light yesterday, when American journalists Clare Gillis and James Foley explained in interviews with the Global Post and The Atlantic that Anton had been shot and probably killed. Anton’s family has said they believe he is dead.